Dolphin Jeevan Saathi which was earlier offered for Rs. 400 is now being offered for a one time charge of Rs. 299. 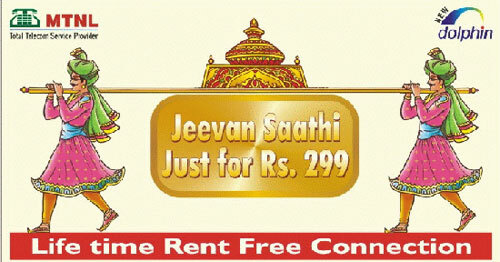 Jeevan Saathi is a life time rent free postpaid connection. UPDATE: All calls to MTNL Delhi Network would be at Rs.1.65/min. Now this is what we call a real Lifetime Plan. I mean no monthly rental, you just pay for the calls you make. The call charges are also less compared to what these private operators offer in their Lifetime plans. No hidden charges, no compulsion makes this scheme simply superb. But again it’s MTNL. Low network coverage plus unattractive marketing has spoilt the brand name of this service provider. Customers think twice before buying it but we suggest that if you like the scheme then simply go for it because the plan is simply irresistible. The newtwork coverage is improved now and No Problem in Mumbai city area,so there is no problem regarding the network. The care of customer is superb all mtnl official name,tel. number,mobile no.Fax number is on web site,so if Helpline(1503/9869012345) not helphing or didnt sourt out the problem of subscriber,then subscriber can direct contect with MTNL. while pvt operator didnt giving this care ever. so the customer care mechenism is superb in MTNL. The call Rate is very low as compair the markets.Superb value of ur money at MTNL only. In the above artical at telegyan web site one thing is missing about this plan that in This Jeevan sathi plan,customer can call MTNL Delhi Network at Just Rs.1.65 only.